Mia Freedman, founder of Australia’s most popular women’s site Mamamia, has a solid following of both lovers and haters on the web. Since her days at Cosmopolitan, to ‘feminist’ writer for Australian women, Freedman has been at the forefront of heavy controversy. Most recently, she was criticised across the media for not paying her Mamamia contributors. This has since changed, yet Freedman is far from free of the controversy around her name. 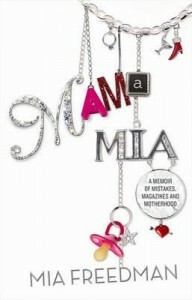 Freelance writer Eleanor Robertson caused havoc on Twitter when she live tweeted her responses to Freedman’s memoir, Mama Mia: a Memoir of Mistakes, Magazines and Motherhood. It’s evident from her responses that she’s not a fan. She continued to make a commentary on Freedman’s ideas about feminism. Criticising her work for Cosmopolitan, and her actions ‘as a feminist,’ Robertson makes it clear that she thinks Freedman is in fact not a feminist at all. Many tweets later, backlash started up against Robertson. Some of Freedman’s co-writers at Mamamia started to speak in her defence. ‘Eleanor, bitching about Mia Freedman & her writing on Twitter just makes you look mean. Not clever,’ said Mamamia writer Rebecca Sparrow. But at the same time, the majority of the twittersphere was more entertained than outraged. Robertson received numerous tweets in support of her views. Mia Freedman hasn’t spoken out about the Twitter attack, but Eleanor Robertson’s Twitter followers have skyrocketed. This entry was posted in Feminism, News and tagged feminism, mia freedman, News. Bookmark the permalink.